A great steak starts with finding the right steak. But how can you tell a good steak from a mediocre steak? Most of us go to the butcher, whether it’s the corner meat market, supermarket, or online store, and find what can appear to be an unending row of cuts of beef. There are a couple of things to look for when buying a great steak. First, there is the grade. The grade speaks about the quality of the meat based on marbling and age. The second factor is the cut. Different cuts have different qualities. Finding the right cut for what you want to grill is probably the most important part of the best steak for your budget and your needs. Grading is typically performed by a third party organization or by a government agency, like the USDA in the United States. The age of the animal and the marbling of the meat determine the grade that is given. Beef is graded by examining the whole or split carcass, so you will find some variance in grades of an individual cut. In the United States, consumer grades are prime, choice and select, with prime being at the top and select being the bottom. The lowest rated meats are not for general retail distribution and become things like meat by-products. Select, while at the bottom of consumer graded meat is still above the 50th percentile of all meat produced in terms of quality. Prime grade beef makes up about 2% of all the beef produced in the United States and typically ends up being exported or sold to fine restaurants. What you will normally find on the shelves at the store is choice and select. Since prime can be more difficult to find and considerably more expensive, your best option is to purchase a choice cut. I suggest trying it because you will notice a difference. Since choice is superior to select you can buy a less desirable cut to compensate for the higher price. One thing to remember about grading is that these designations are formulated to be friendly to the multi-billion dollar Beef Industry. There is a considerable amount of thought that goes into brand names that show up on that label, so read carefully. Marbling is an important factor in steak selection. To visually determine the marbling of a steak, take a good look at the texture of the meat. If the meat is free of all fat, then the cut has little or no marbling. Though this is a leaner and often more tender, it is not as flavorful. Small streaks of fat through the meat will produce a more flavorful steak. When selecting a steak always take a look at the marbling. Remember, the more marbling, the less tender, but the more flavorful. This creates something of a balancing act to find the steak that is both tender and tasty. Marbling should be thin streaks of fat. Thick lines of fat mean the steak contains a lot of connective tissue that will make it tough. What to look for in a good steak is the color. The meat should be bright red and the fat, a creamy white, evenly distributed throughout the meat. Cuts of steak can be broken down into three sections. Starting on the upper back and moving down to the mid-back you have the rib, the short loin, and the sirloin. The rib contains cuts such as the rib roast, the rib-eye steak, and the back ribs. This is the least tender section of the three. The short loin produces the T-bone, top loin steak, tenderloin, and the porterhouse. The sirloin gives the sirloin steak and the top sirloin. Other steaks like the chuck, round and flank steak come from those respective areas and tend to be tough cuts of meat. 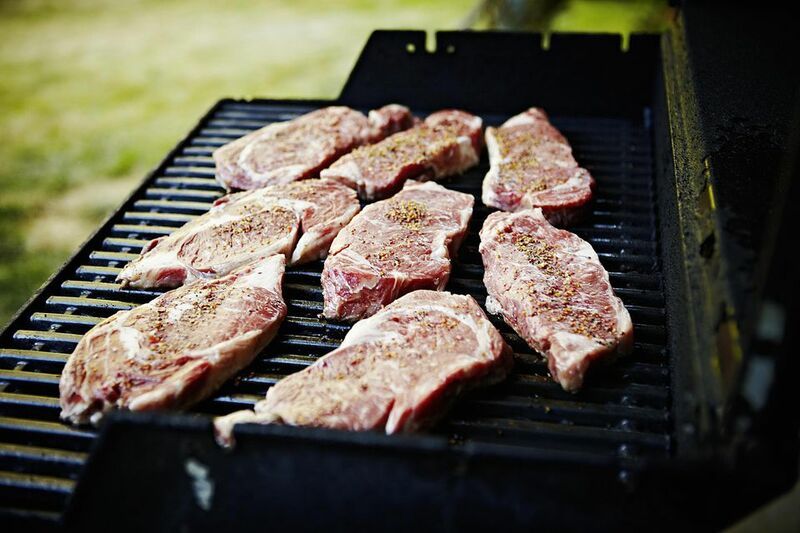 Strips steaks, like the New York Steak, is cut from the T-bone portion. The most tender cut of beef is the tenderloin. From this area, you will get cuts like chateaubriand, filet mignon, and tournedos. Though these cuts are tender, they are less flavorful. The rib-eye is less tender but far more flavorful. The same holds true about the sirloin cut.